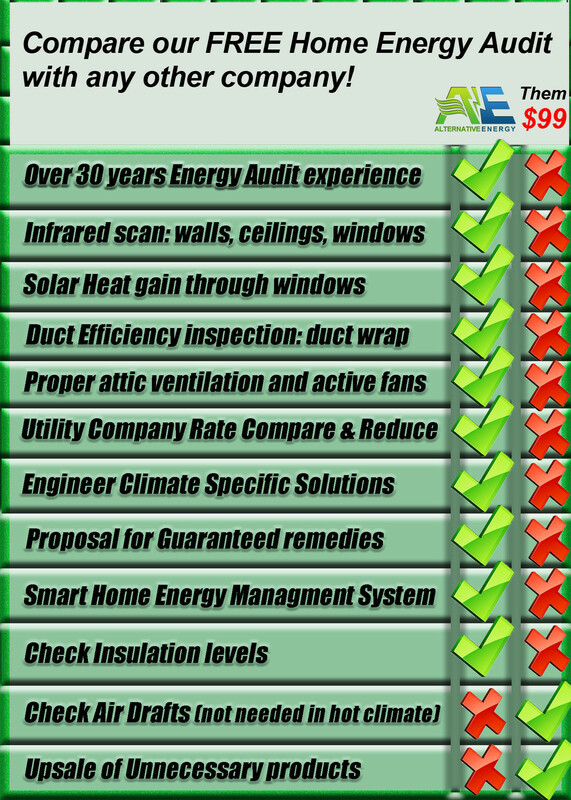 RECEIVE A FREE HOME ENERGY AUDIT IN SCOTTSDALE - SAVE 25-99% ON ELECTRICITY! Searching the phrase “Home Energy Audit Scottsdale” while looking for energy contractors near you to evaluate your home to see how you can save more money on electricity? If yes, Alternative Energy, LLC can help in multiple ways! Alternative Energy, LLC provides a variety of energy saving products for residential homeowners who live or do business in the Scottsdale Area. Click here to find out how you can save up to 50% on electricity or schedule your free home energy audit. We will use our findings to develop a custom energy savings plan just for you. We use the latest energy technologies and instruments to pinpoint your power consumption issue and offer affordable energy services and products to help you save 25-99% on your APS or SRP electric bill. We offer energy saving products and solutions that can help Scottsdale homeowners save 25-99% off their power bill guaranteed! How can we guarantee this much energy savings? We make these kind of guarantees because we know our energy products work! Our SRX (better radiant barrier), for starters, is a patented radiant barrier technology that is better than current radiant barrier foil (Proven Studies) and has a lower emissivity rating than any other material on the planet, including silver! A free home energy audit helps our auditors evaluate which energy saving services and products are best for your individual home. Not every home is great for solar because their type of roofing system doesn’t work well for solar and some home can’t use radiant barrier technology because they don’t have an attic to put it in etc. As you can see, we don’t just assume every home has the same energy problems because they don’t. We offer custom energy saving services and products specific to your home. How Do I Qualify For A Free Energy Audit In Scottsdale? cannot be an apartment or townhouse/condo with a joined roof. Most homeowners will qualify for the free energy audit but if you are concerned you might not qualify, you can always send us a quick call or email to verify. The home energy audit will be performed by our home energy experts. We are offering the free energy audit at no charge, so hurry and call today at (480) 744-1803 before the free energy audit expires. 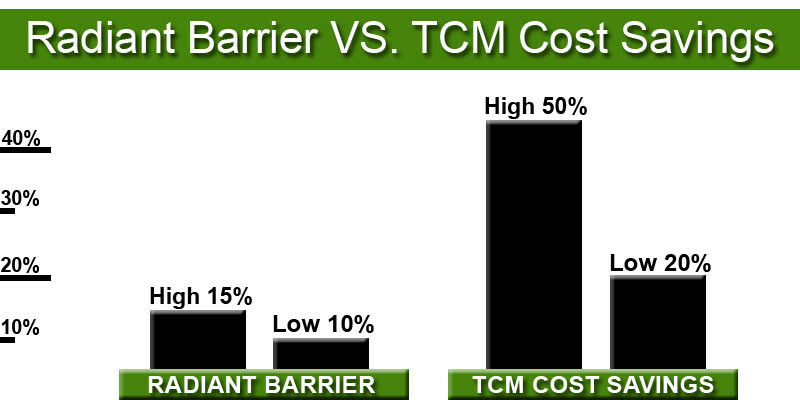 Effectiveness of radiant barrier or insulation – Our SRX product is much better at saving you money than other radiant barrier products and can save you 10-35% more on electricity. Also, new radiant barrier customers who don’t currently have radiant barrier installed on their attic can save as much as 25-50% on their electric bills just by installing radiant barrier alone. Restrictions or leaks in air-duct vent system – We also inspect your home’s air ducts for heat. Most air ducts are very thin or have leaks that let in the heat from your attic. We have solved that problem with our Patented SRX duct wrap product which can be applied around the air ducts to keep them cool no matter how bad the hot spot areas in your attic are. Attic Hot Spot Areas – Your attic is by far the biggest power consumer in your home. Your AC performance and air ducts are severely effected by your attic. Your AC is most likely blowing at a cold temperature but the heat coming from the attic is heating up your air ducts which heats up the air coming out of the ducts and making it into your home. This makes it take longer to cool your home and costs you more money on electricity. Our SRX radiant barrier and duct wrap product will completely solve that problem, save you up to 50% on electricity and keep your home more comfortable than ever before! After completing the free home energy audit, our energy experts will recommend energy improvements and upgrades with a full energy savings breakdown. We will also make you aware of any financing options or rebates that can help you offset the the cost of installation right away. We offer a variety of energy saving products and services for residential homeowners that can help you save a lot of money on electricity. We offer a variety of patented insulation products such as radiant barrier and spray foam insulation that can help you home block out the sun – your home’s #1 source of heat gain and money loss. Use the links below to find out more about how installing insulation can help you save more money on electricity. Solar power energy is growing in Scottsdale, Arizona. Everyday, more and more homeowners are choosing solar for its many environmental and financial benefits. Use the links below to find out more about residential solar panels and how they can help homeowners save money on electricity. Residential load controllers help balance your overall electricity usage during the most important times so that you only use energy during low cost kilowatt hours. Installing a residential load controller is affordable and can help handle the high costs of residential electricity for homeowners in the Scottsdale, Arizona area. Read more about residential load controllers below. We also offer garage mini split ac units to help cool garages in Scottsdale, Arizona, ductless ac units/mini split systems for more affordable cooling of your home and tubular skylights to help with residential lighting costs. Read more about our other energy saving solutions below. OUR ENERGY PRODUCTS HELP SAVE 25-99% ON ELECTRICITY! Receive a free FREE HOME ENERGY AUDIT in Scottsdale or anywhere in the Phoenix Valley by giving Alternative Energy, LLC a call today at (480) 744-1803 or by filling out our contact form. Alternative Energy, LLC is a full-service energy contractor in Scottsdale, Arizona, offering new and patented energy products including: The best attic radiant barrier (SRX), garage insulation, ductless ac units, motor driven and solar attic fans, residential load controllers, spray foam insulation, tubular skylights, solar panels and more. Have a question? Give us a call today, fill out our short contact form for a quick question.